Including contributions from leading experts in the field, this book covers applications and developments of heuristic search methods for solving complex optimization problems. The book covers various local search strategies including genetic algorithms, simulated annealing, tabu search and hybrids thereof. These methods have proved extraordinarily successful by solving some of the most difficult, real-world problems. At the interface between Artificial Intelligence and Operational Research, research in this exciting area is progressing apace spurred on by the needs of industry and commerce. The introductory chapter provides a clear overview of the basic techniques and useful pointers to further reading and to current research. The second section of the book covers some of the most recent and exciting developments of the basic techniques, with suggestions not only for extending and improving these but also for hybridizing and incorporating automatic adaption. The third section contains a number of case studies, surveys and comparative studies which span a wide range of application areas ranging from the classic Steiner tree problem to more practical problems arising in telecommunications and data analysis. The coverage of the latest research and the illustrative case studies will ensure that the book is invaluable for researchers and professionals with an interest in heuristic search methods. V. J. Rayward-Smith is the editor of Modern Heuristic Search Methods, published by Wiley. 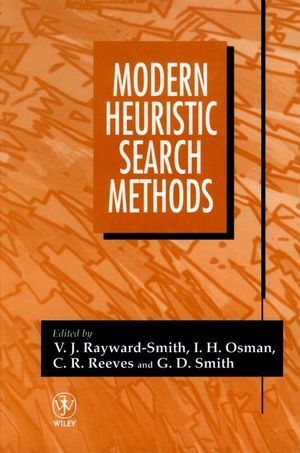 I. H. Osman is the editor of Modern Heuristic Search Methods, published by Wiley. C. R. Reeves is the editor of Modern Heuristic Search Methods, published by Wiley. G. D. Smith is the editor of Modern Heuristic Search Methods, published by Wiley. Localized Simulated Annealing in Constraint Satisfaction andOptimization. Observing Logical Interdependencies in Tabu Search: Methods andResults. Reactive Search: Toward Self-Tuning Heuristics. Integrating Local Search into Genetic Algorithms. Local Search for Steiner Trees in Graphs. Local Search Strategies for the Vehicle Fleet Mix Problem. A Tabu Search Algorithm for Some Discrete-Continuous SchedulingProblems. The Analysis of Waste Flow Data from Multi-Unit IndustrialComplexes Using Genetic Algorithms. The Evolution of Solid Object Designs Using GeneticAlgorithms. The Convoy Movement Problem with Initial Delays. A Brief Comparison of Some Evolutionary Optimization Methods.